The behaviour of US productivity since this book was originally publishedin 1994, has added new relevance to the relationship between profits and productivity. In the long run, productivity growth determines the economic standard of living. 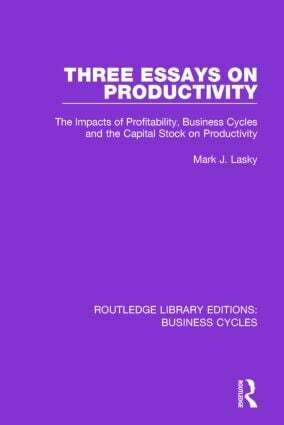 This book is divided into three parts: the basis of the first is the empirical finding that, controlling for normal business cycle effects, productivity grows faster when profits have been low than otherwise. The second part discusses how to measure marginal cost using time series data and the third tests a basic assumption that productivity growth is exogenous to labour and capital. 1. Do Low Profits Stimulate Productivity Growth? 2. Deferred Marginal Cost: An Explanation for High Estimated Markups 3. Simultaneity in Freely Estimated Production Functions.